The subtle, creamy flavor of the coconut milk makes this soup taste unbelievably good! For those of you who might not be that familiar with Thai cuisine &/or its soups, tom yum (ต้มยำ), which is pronounced [tôm jam] in Thai, is the generic name for a number of spicy, hot & sour soups found in both Thai and Laotian cuisine. There are many different versions of this soup, but all generally contain the same basic broth, which is typically comprised of soup stock, lemongrass, kaffir lime leaves, galangal (a.k.a. "Thai ginger"), lime juice, fish sauce, and crushed Thai chili peppers. Sometimes nam prik pao (น้ำพริกเผา) -- a Thai chili paste containing soy bean oil -- is also added, which gives the soup a bright orangish-red colour and obviously jacks up the chili flavor (& the heat!) in this soup. As a final flourish, the soup is then generously topped with cilantro &/or Thai basil. Although there are a zillion different versions of this soup, here's a brief listing of some of the more common varieties: When tom yum is made with prawns or shrimp that've been cooked in a seafood or chicken broth -- i.e., one that does not contain coconut milk -- it's then called tom yum goong or tom yum koong (ต้มยำกุ้ง). The kind that's made with chicken is called tom kha gai (ต้มข่าไก่), which literally translates into "chicken galangal soup." (This version has coconut milk in it, but the galangal & the chicken are the predominant flavors.) Tom yum pla contains fish, while a similar but lesser-known variety (outside of Thailand), called tom khlong, is made with smoked fish cutlets & originates in northern Thailand. 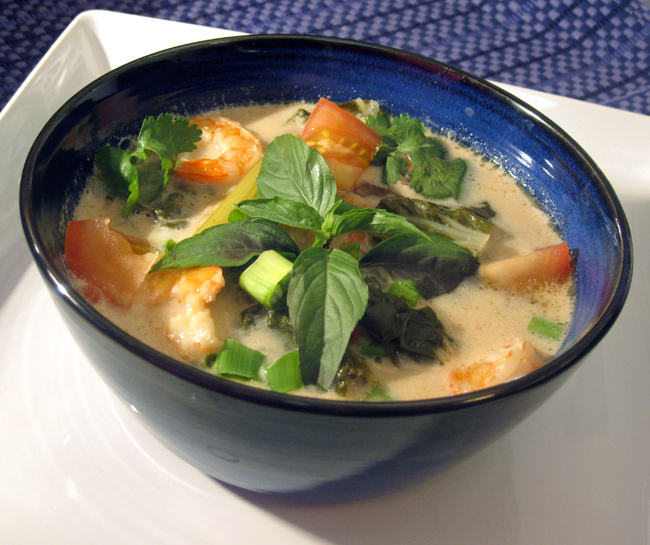 When mixed seafood is the primary ingredient, the soup is either named tom yum thale or tom yum po taek. And lastly, there's tom yum nam khon (ต้มยำน้ำข้น), a relatively more modern variety of tom yum, which is made with prawns & coconut milk, & is today's featured recipe. If it's your first time making tom yum (&/or Thai dishes in general), I strongly recommend that you stick to the recipe template during your first go-round. Then, after you've become comfortable working with the ingredients & balancing the various soup flavors, feel free to experiment. Directions: Bring chicken broth, water, & coconut milk to a rapid, rolling boil in a large, 8 qt. nonstick stock pot over high heat, about 8 minutes. While liquid is boiling, add onion, garlic, galangal, Thai chili peppers, nam prik pao (if using), tamarind paste, & salt to a food processor & pulse until galangal & garlic have become finely minced & well-combined with the other ingredients. Add this mixture to the soup, once it's come to a boil. Next, add the lemongrass, cilantro root, kaffir lime leaves, & fish sauce. Boil for 5 minutes. Then add mushrooms & baby bok choy, & boil for another 1-2 minutes, or until just tender. (The cooked bok choy should retain some of its firmness & still have a slight crunch to it.) Add the raw shrimp & cook until they turn pink, i.e., only about 1-2 minutes or so under a rolling boil. Turn off stove range & remove pot from heat. Add the lime juice & sesame seed oil (if using) & stir well to combine. Taste soup adjust the seasonings as necessary, to suit your personal preferences. Discard lemongrass & lime leaves before serving. Ladle out soup into bowls. Garnish each bowl with tomatoes, scallions, Thai basil, cilantro, & additional (sliced) chilies (if desired). Serve hot, accompanied by a plate of lime wedges for those diners who wish to season the soup with additional lime juice. Chef's Notes: Most of the above ingredients, especially galangal , lemongrass , & kaffir lime leaves , etc., can typically be found in most Asian markets. Or, if you don't live close to an Asian market, you can buy them online, either separately or as a Thai spice combo pack . My online store stocks many, if not most, of these specialty products. 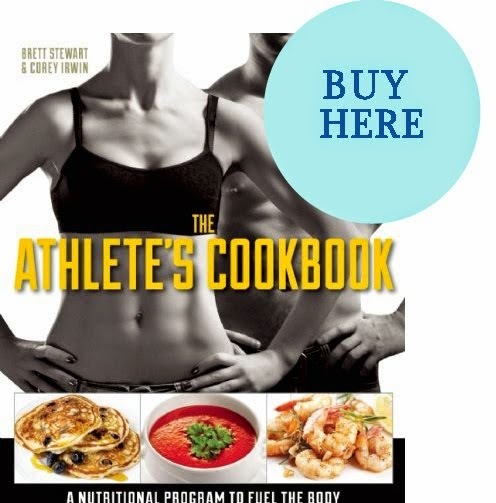 Check the "favorite gourmet groceries" and "favorite herbs & spices" sections. Substitutions: If you can't get a hold of some galangal, regular ginger root can be used as a substitute, but it really doesn't impart the same flavor to the soup. Also, please be sure to use Thai basil and not regular Italian sweet basil; Thai basil has a peppery taste, & works much better for tom yum. Also, if you don't happen to have any chicken broth on hand, you can easily make chicken stock by boiling pieces of cleaned & washed (raw) chicken in water, leaving the meat on the bone. Preparation tips: Tom yum typically requires crushed chili peppers & garlic, usually smashed with the back of a heavy knife or in a mortar & pestle. To save time, I used a food processor instead. :) Essentially, the same net effect is achieved: The fragrance & flavor of the spices & herbs have been released. A brief word about fish sauce & its application in Southeast Asian soups: Now some of you who aren't used to the taste of fish sauce might go "ewwww" at the mere thought of it. To be honest, I wasn't exactly a huge fan of it either until rather recently, i.e., after I learned how to use it properly. ;) However, let me assure you this particular soup recipe has a very mild & subtle flavor, and the fish sauce is barely even detectable. Variations: If you prefer a mild broth, use shallots instead of onions, & be sure to seed & de-rib the chilies.